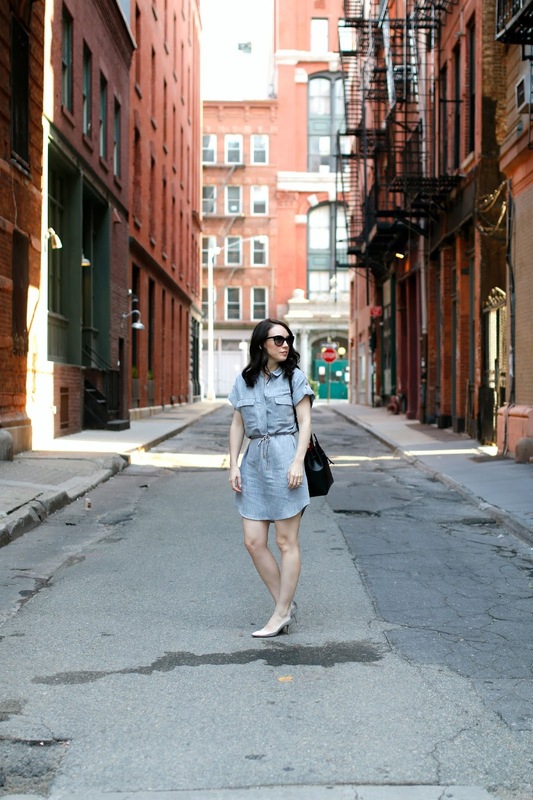 I live for a shirtdress. My closet is full of them and this blog is full of them. (See past posts here, here and here) I find them professional and polished yet so comfortable and easy to throw on. I wear this with heels to work or with my Vince sneakers for running weekend errands. I particularly liked this one because it came with a cute belt (which saves me from having to find one) and there is no gaping or pulling around the bust area. And while it is perfect for hot NYC summers, I can top it off with an oversized sweater and wear it over my faux leather leggings (love these and these) for the fall/winter. Speaking of fall, I am slowly beginning to add pieces here and there to my closet (just picked up this vest), rather than doing one big haul. I find that if I add a few new items each season, it can make my wardrobe feel refreshed and exciting again. I am not happy that summer is ending but if fall has to come, I might as well get myself dressed and ready for it. I totally agree on slowly adding pieces to your wardrobe instead of one big shopping trip. By adding a few pieces over the course of several weeks you still feel refreshed without the major spending spree. Love this dress! Great transition piece.